I hope he gets condoms too. He won't be able to fit another kid in there. Children on sale. Buy 1 get 1 free. I have a kid? Where? b.f.d. I have done much worse. How about a sombrero nachos and dip hat on the child's head as a mobile appetizer platter during my house parties. is that a prosthetic leg or what? LOL I do this all the time with my kids. They need to help too! Ah geez, where's the frickin' barcode. 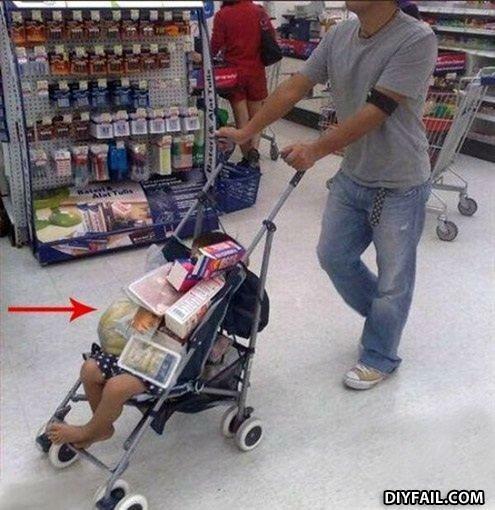 Price check on midget in a pram! Well I didn't want the kid in the first place. a child?! wait a minute, where's my shoping cart!!??? Some say Helen Keller can't write a good book. You know what she said?